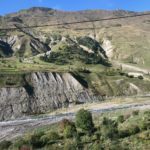 We retrace our miles south down the Military Road through sheep herds; following deep gorges, waterfalls and lakes; through the magnificent scenery of the Greater Caucasus as its trees begin to show their fall colors. Today we learn about a more somber time of history. One should never forget history: the who, what, when and why. Sometimes there are no answers to why, but there are always lessons to be learned. We turn east near Natakhtari. Our very first siting is the Tserovani Refugee Camp. This area of northeast Georgia borders the disputed territory of South Ossetia and Abkhazia which is currently occupied by Russia and supported with several military bases. After the 5-days war in 2008, and the occupation by Russia of this South Ossetia region, over 30,000 people fled their homes. These territories of Akhalgori (near the Black Sea) and Tskhinvali continue to be hotly disputed. The neat, well-organized Tserovani Camp houses more than 8,000 refugees, mostly from the region of Akhalgori, which was undisputed territory before the 2008 war. The refugee camp was built right after the war and there are 12 more settlements like this one around the region, although this camp is the biggest. Most of Tserovani occupants have Georgian roots but there are also some Ossetians. They were forced to leave their houses and although some of them have permission to return, they prefer to live in the settlement free of Russian overseers. Others have had their homes totally destroyed and have nowhere to return. There is a total of 230,000 refugees who have fled Russian occupation to live in Georgia; they are welcome, given homes and integrated into Georgian society. In fact, currently, 20% of Georgian territory is occupied by Russia. The future of these displaced persons remains unresolved. Many borders are now closed and no diplomatic relations now exists with these two automous regions. It was mentioned that Georgians were very disappointed when Armenia recently joined four others, including Russia, Nicaragua, and Venezuela, in recognizing these regions. Nearby is a part of Georgia the Russians evidently don’t care to occupy. It is the town of Gori, famous because it was the birthplace for Joseph Stalin in 1879. Recognized as one of the most brutal dictators in history, Stalin was also a U.S. ally in WWII. Stalin was not the kind of man one could trust as his generals, cabinet members and political rivals learned (Winston Churchill particularly warned Roosevelt not to trust him). However, what I find fascinating is how such leaders and tyrants are later viewed by history and their own people. My first clue of how Georgians view their homeboy comes from the museum address: Stalin Avenue right by the well-maintained Stalin Park. His boyhood home has been moved onto the grounds. 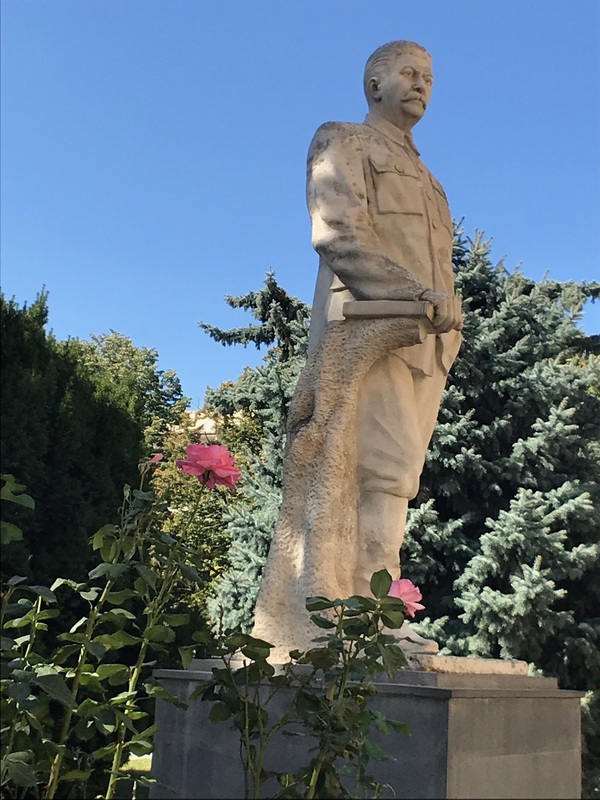 A statue of Stalin graces the front of the Joseph Stalin Museum. 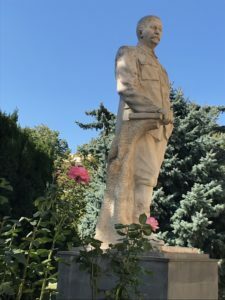 As the local’s relate the story: Stalin drank some diluted Georgian wine on 28 February 1953, possibly laced with poison. At his dacha that night, Stalin’s closest “drinking” buddies included Georgy Malenkov, Stalin’s likely successor; Lavrenti Beria, his astonishingly cruel chief of secret police, who was jockeying for power; Nikita Khrushchev, the surprise addition whom Stalin included to balance the power dynamics of Malenkov and Beria; and Nikolai Bulganin, Stalin’s defense minister. Documents found just in the last few years would indicate Stalin’s death was more than a stroke. Notations indicated there was stomach hemorrhaging, indicative of possible poisoning. Beria, hoping to take over, was the likely culprit. Stalin was distrustful to the point of paranoia. But then legend has it that Stalin himself plotted to hasten Vladimir Lenin’s death 30 years earlier. Stalin was not happy with Beria so perhaps Beria took matters into his own hands and spiked Stalin’s fruity Georgian wine with a little poison. Ironically, things did not work out as planned for Beria. Outsider Khrushchev outmaneuvered his enemy Beria, became the next Soviet Premier and Beria was eventually taken into one of his own jail cells and shot. I am told that 90% of all Georgians believe Beria poisoned Stalin. 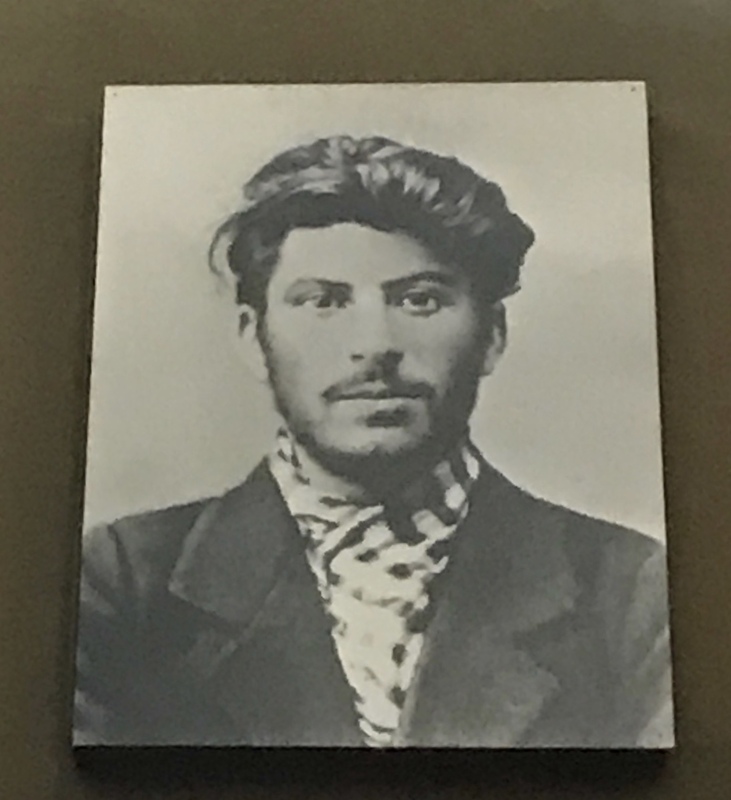 In spite of his reign of terror that caused tens of millions to die, Stalin remains “Uncle Joe” to many Georgians, enough so that they built him a museum in Gori. 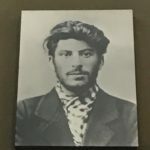 The two story Stalin Museum is large, well-maintained and documents Stalin’s life through photos, documents, art, personal possessions and memorabilia that is well explained. Items include paintings, a plethora of portraits, his death mask, and military memorabilia. 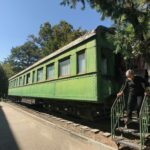 Stalin’s personal bulletproof pullman railroad car is also on display. 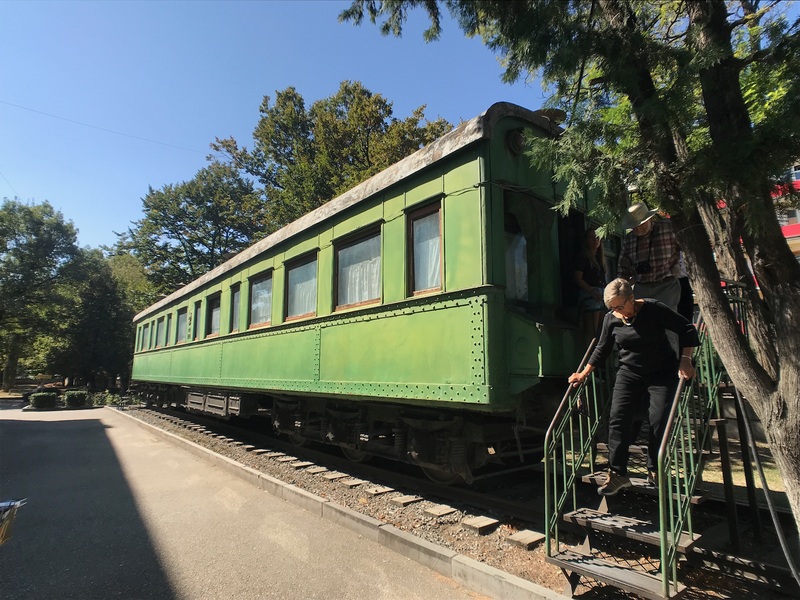 The rail car was heavily armored and used by Stalin at the historic Tehran Conference in 1943. Roosevelt should have taken the hint at this conference when Stalin proposed executing 50,000–100,000 German officers so that Germany could not plan another war. Roosevelt, believing Stalin was not serious, joked that “maybe 49,000 would be enough.” Actually, Stalin was serious. I could spend more time in Gori. Nearby a medieval Fortress commands a hilltop. It has stood there since the 13th century with ruins dating back centuries before that t. Gori also has a Great Patriotic War Museum that I would love to explore to better understand other’s attitudes and perceptions of history. However, following my dose of “Stalinmania,” I take a well-deserved nature break in Borjomi Nature Reserve at Borjomi Gorge. The mountainous scenery, forests, valley meadows, lively rivers and panoramic views are spectacular. I would not want to personally drive this curvy two-lane road (wide enough for two cars and at least one more vehicle creating an imaginary passing lane) but I enjoy the views. 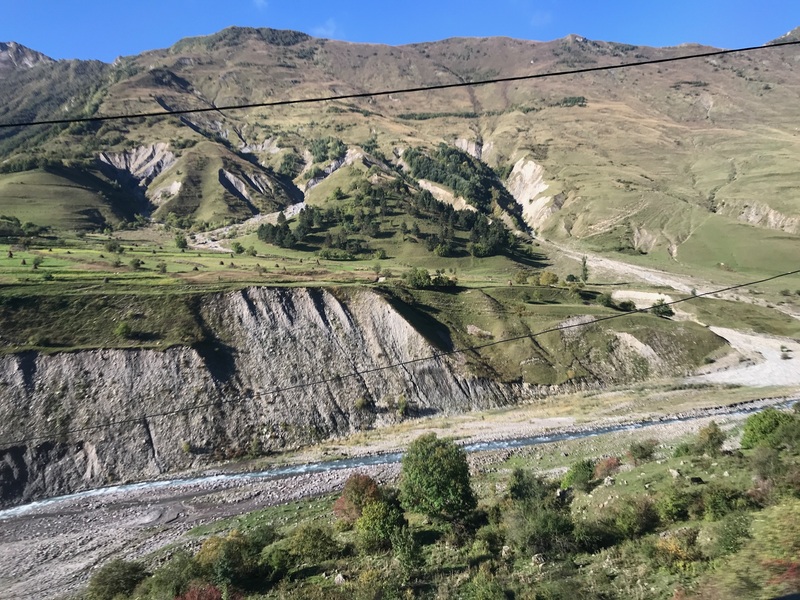 For miles on all sides are national forests, protected areas that are part of the Lesser Caucasus. We zoom through the small resort town of Borjomi (applied for the 2014 Winter Olympics), known for its mineral water. We are able to stretch our legs on a pleasant nature walk through a pristine forest just beginning to shed its leaves for fall. 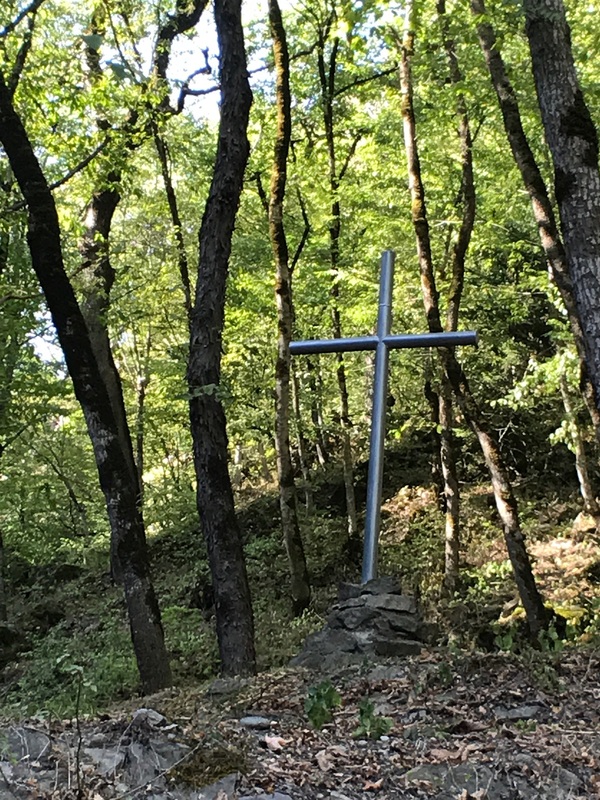 A small stream of crystal clear Borjomi water borders our trail, at the end of which is the Mtsvane Monastery, or Green Monastery, which dates from between the 9th -10th centuries. The “Green” designation evidently comes from the unique green color of the trees in the forest. The building stones of the monastery are also shades of green. During the 16th century, a Persian shah invaded this monastery and dozens of monks were killed or tortured. Legend is that bloody stones were thrown into the Chitakhevi River, enough to cover almost the entire length of the river running through the territory of the monastery. Suddenly, I don’t think the water quite so pristine any longer. The monastery, other than in a spectacular setting, is simple, as one would expect in this environment. A sturdy two-story bell tower, with skulls, and a small chapel are on site. On one side of the chapel is a bas-relief of St. George fighting not the ubiquitous dragon but a whale. The interior has been restored and the apse and icons of the chancel are nice. If the name of the monastery is familiar, it might be that the area is better known for the Mtsvane variety of grape used to make popular Georgian white wine. In the Georgian language, Mtsvane means “new, young and green.” Four Mtsvane wines have won Gold Medals at the annual Wine Expo Georgia, the only international wine fair in the Caucasus. 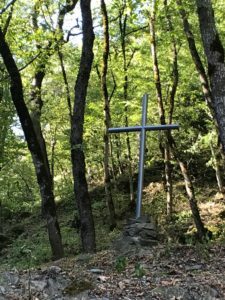 I am willing to leave the solitude of the monastery to continue another 25 miles of curves to Akhaltsikhe, for I am promised there is a glass of Mtsvane at the end of today’s trail.